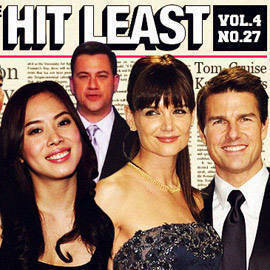 Plus, the Tom Cruise-Katie Holmes split and more nutty tales. 1. PAMPANGA’S FIRST DISTRICT REP. CARMELO LAZATIN WRITES TO THE PEOPLE WHO RUN DISNEYLAND AND ASKS IF ONE COULD BE SET UP IN CLARK, PAMPANGA. That’s a cute idea-but don’t you have anything better to do? 2. A TRUCK TRANSPORTING PIGS BREAKS DOWN ON SLEX AND THE PIGS ESCAPE AND RUN ALL OVER THE PLACE. (LATER ON, THE POLICE OFFICER BEING INTERVIEWED ABOUT THE INCIDENT TRIES NOT TO LAUGH.) Sometimes truth is really stranger than fiction. 3. CLASSROOMS IN CAPIZ’S PRESIDENT MANUEL ROXAS MEMORIAL HIGH SCHOOL GET FLOODED WHILE STUDENTS ARE IN CLASS. When things like this happen, it becomes painfully obvious that this country’s priorities are all screwed up. 4. SEN. KIKO PANGILINAN LAMENTS THE SLOW RESOLUTION OF CASES IN THE COUNTRY. Can you picture molasses in the snow? It moves slower than that. <>5. SUSPECTED PEEPING TOM IN RODRIGUEZ, RIZAL GETS BEATEN UP BY ENRAGED CITIZENS. Instant mob-style justice has its moments, but how do we know he won’t do it again? <>6. REP. MITOS MAGSAYSAY FEELS SLIGHTED BY SEN. FRANKLIN DRILON’S COMMENT ABOUT THE "REAL MAGSAYSAY" (JUN MAGSAYSAY WHO WILL BE ONE OF THE LIBERAL PARTY’S SENATE BETS). It’s never too early for some passive-agressive mudslinging. <>8. TOM CRUISE AND KATIE HOLMES SPLIT UP AFTER FIVE YEARS OF MARRIAGE. Everybody else is saying it: It’s amazing that it lasted this long. <>9. KFC PHILIPPINES’ CHEESE TOP BURGER GETS INTERNATIONAL ATTENTION VIA GAWKER.COM AND JIMMY KIMMEL LIVE!, WHICH EVEN CREATED A SPOOF AD FOR IT. Memo to KFC: It may be wise to tell the people answering all your delivery hotline personnel about it now. <>10. 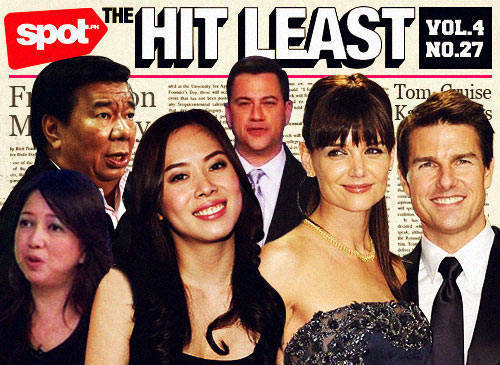 ARA MINA CONTINUES TO SHED TEARS OVER HER NASTY TIFF WITH HER HALF-SISTER, CRISTINE REYES. When tears fail, call an exorcist.